We tend to think of a term like 'war zone' as having a perverse degree of equality to it, a battlefield in which two opposing military forces engage in conflict. Oh it all sounds so harmless, "engage in conflict," the language of personal relationships used to describe the process of people killing each other en masse for reasons that rarely come even remotely close to justifying such action. But war zones aren't always so evenly balanced, and sometimes the only thing you have to do to find yourself in a war zone is to be an ordinary citizen going about your everyday life. 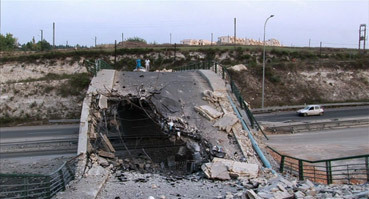 Such was the case during the 2006 Lebanon war, when the Israeli military responded to a Hezbollah rocket attack by launching a blitz of air strikes on the Lebanese civilian infrastructure. The conflict left over a thousand people dead and about a million Lebanese and almost half a million Israelis displaced. Following a ceasefire negotiated by the United Nations, most were able to return to their homes, but for many Lebanese there was structurally nothing left to go back to. It was experience of similar battles that drove experienced Lebanese filmmaker Philippe Aractingi, previously known for his extensive international documentary work and his smash hit musical Bosta, to create a film that asks us to appreciate the devastating effects of such a bombing campaign on the ordinary citizens forced to live with its consequences. A straightforward setup is used to get the two main protagonists on the road and into the danger zone. With the ceasefire in place, middle-class Ziena Noureddine is desperate to return to the southern village of her birth to locate her sister Mahir and her son Karim, whom she has been unable to reach by phone for several days. The only driver willing to venture into the heavily bombed region is the opportunistic Tony, who demands a sizeable fee for the risks such a trip will entail. Their journey is frustrated by bomb-damaged roads and the fact that they seem to be repeatedly one step behind Ziena's relocated relatives, while the devastation they witness and the stories they hear have a considerable effect both on them as individuals and on their attitudes to each other. A somewhat familiar and potentially trite tale of a mismatched couple whose initially fractious relationship mellows into mutual respect, friendship and perhaps even something more is leant substantial gravitas by Aractingi's approach. In a bold and potentially dangerous move, the director took his two lead actors into South Lebanon just days after the ceasefire in order to fashion a fictional story in a realistic setting and to incorporate real world action, experiences and opinions into his unfolding narrative. It's a risky strategy in every respect, requiring a flexible approach to story structuring and the actors to improvise in situations where there are no guarantees that reality will cooperate, as well as taking the cast and crew into areas still at risk of rocket attack should the hostilities resume. A delicate touch is also required if the performed elements are to successfully meld with the documentary setting, a process that only falters when the developing relationship between the two leads falls victim to convention. But this is a minor blip in an otherwise memorable journey, one whose real-life encounters provide much more than background texturing. The landscape alone tells a sobering story, the intensity of the shelling grimly illustrated by the districts whose buildings have been reduced to rubble and whose roads have been rendered impassable by chasmic bomb craters, none of which would have would have made it into the film without a sizeable CG budget had it not been shot on location. Equally persuasive is the incorporation of real stories of death and displacement from those who were caught up in the bombing: the proudly upbeat female garage owner whose livelihood has been destroyed but who is determined to rebuild it with the help of her son; the young boy who relates how he survived an attack while a boy he was hiding with was killed; the woman whose loss is so genuinely painful that it reduces Nada Abou Farhat, the actress playing Ziena, to very real tears. It's in scenes like this that the drama-documentary crossover is at its most effective – later, as Ziena walks amongst actual journalists and arriving French troops, the characters feel and much part of the real story as they did in the famed climax of Haskell Wexler's Medium Cool. This approach also brings a sense of real-world frustration and danger to fictional characters, the intermittently shifting expectations about whether things will work out OK for either adding a fingernail-chewing layer of tension to their decision to ignore advice and drive along a potentially lethal road at night. There's been some discussion over whether the film is anti-Israeli or simply pro-humanity. It's certainly and persuasively the latter, but considering where the story takes place and the fact that the film focuses exclusively on the effects of an Israeli bombardment of civilian districts, there are inevitably some heartfelt views expressed within the film itself by those whose lives have been destroyed. Given what she and her family have just been through, the claim by the woman whose story so moved Ziena that this is "what Israel wants – they're aiming at women and children, anywhere with civilians," is understandable in its anger, while a sense of foreboding for future relations between the two peoples is provided by the woman from Ziena's village who ends a conversation with the words. "Yes, the hatred keeps growing." But a note of optimism is nevertheless struck in a comment made by a man who provides Tony with news of his exiled brother and his two sons, all of whom now live in Israel. "Jews and us, we're the same," he tells him. "Same look, same face... same mold. Shopkeepers like us, only richer." Under the Bombs was shot on pro-sumer high-def video for expedience, which also enhances the documentary feel of the handheld imagery in which the actors interact with their true-life surroundings. A crisp and pleasing anamorphic 1.85:1 transfer boasts solid colour reproduction and deep blacks. The contrast is generally fine, though a little strong at times on bright daylight exteriors where fill-in lighting has not been used. News and amateur footage has also been incorporated and there have been no attempts to disguise the source, with some of the opening bomb attack footage retaining the date and time stamp of the camcorders on which it was filmed. The transfer is well coded and upscales to HD screens impressively (especially considering it was shot on HD, then down-converted to DVD and is being up-converted back to its original format and resolution), retaining the detail, colour and contrast, although a little more shadow detail is lost in the higher contrast scenes. Compression artefacts occasionally more visible than they are on a CRT monitor, but are minimal. Dolby 2.0 stereo and 5.1 surround tracks are on offer. Frontal separation is more distinct on the 2.0 track, but the 5.1 track is more subtle, with the surrounds effectively used for location sound and music. Some sound effects (tanks and other vehicles) use the full sound stage effectively without shouting about it. Like many such interviews on Artificial Eye discs, this appears to have been shot in one of their offices (the video cases behind the interviewee give the game away), but unlike most previous examples the sound is a little tinny and includes enough room echo and background noise to suggest that the on-camera mic was used rather than the usual external device. Aractingi usefully backgrounds the production and the process of shooting particular sequences, though does make sure we are aware of his qualifications for making a film in which improvisation and documentary are key elements. The interview is conducted in English. A brief intro to a screening of the film and an extract from the presumably longer Q&A that followed. Interesting, not least for the question posed by the Lebanese audience member. Shot in the same location as the Philippe Aractingi interview and with the same microphone issues, this is a busy chat with lead actress Farhat, who talks about the anger that drove her to become involved in the film, working with director Aractingi and fellow actor Georges Khabbaz (who, we are informed, was principally known before for his comedic roles) and their approach to the documentary elements. She also reveals that the project was planned before there was any hint of a ceasefire and that the original intention was to go into the war zone while the bombs were still falling. This is also conducted in English. An urgent and persuasive humanitarian road movie in which the central narrative plays almost second fiddle to the compelling background detail and the true stories encountered en route. Two very fine lead performances keep us caring for the quest of their characters, but it's the texturing that makes Under the Bombs so affecting. Another fine disc from Artificial Eye delivers on the transfer and the typically interesting interviews (in spite of the slight sound problems).